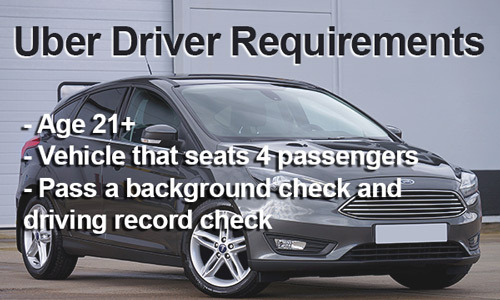 Home / Uber / Uber driver requirements: Do you qualify to drive? Want to drive for Uber? Apply to drive for Uber with my referral link (USA only) and you’ll be eligible for the best bonus in your area. I may receive a commission for referring you. This page covers the Uber driver requirements for UberX, XL, Select, and POOL, the services that allow drivers without a commercial license or commercial insurance to give rides to Uber passengers. Learn the differences between the Uber services here. Drivers for UberBlack and UberSUV must meet a different set of qualifications that you can read about here: UberBlack and SUV driver requirements. In this post you will learn all of the necessary details about the Uber driver requirements, so you can be more confident that you can apply and get accepted by Uber. If you’d like to apply now, click here to apply to drive with my referral link to be eligible for the best new-driver promotion in your area. I may receive a bonus if you sign up using my link. Does your vehicle qualify for Uber? Uber vehicle requirements: Does your car qualify? Need a car to drive for Uber? Should you buy, rent, or lease a car to drive for Uber? Uber accepts vehicles that are 10 years old or newer, but many cities have different model year requirements that you can find at uber.com. The vehicle must have 4 doors and seatbelts for at least 4 passengers, not including the driver. 2-door vehicles are never accepted. Vehicles older than the model year requirement are never accepted even if the vehicle is in great condition. Uber does not accept vehicles with a salvage title or ‘restored’ title. To find the exact model year requirement for your city, go to “uber.com/drive/*your-city*” For example, uber.com/drive/los-angeles leads to an LA-specific page that lists the vehicle requirements for that city. If that doesn’t work, try googling “drive for uber in *your city*” and look for the best result from Uber.com. If you don’t currently have access to a vehicle that qualifies for Uber, you can apply to drive first and get access to a car later. To apply without a cary, visit the Uber driver application and select the “I need a car” option. That way, you can go through the background screening process, and if you’re approved to drive you can buy, rent, or a lease a car. Hyrecar, a peer-to-peer vehicle rental service, is a good way to try driving for Uber without having to buy a car or commit to a long-term lease. Before you start driving for Uber you will need to have your vehicle inspected at an Uber activation center or at a state-licensed auto repair facility in your area. The inspection is free if you get it done at an Uber activation center, and it costs around $30 if you have it done at a state-licensed auto repair shop. The inspection looks at mechanical and safety features of your car like the condition of your tires, brakes, lights, and seat belts. Note: Not every city requires a vehicle inspection before you get started. Some cities give you a grace period (around 30 days) before you need to have your vehicle inspected. Follow instructions from Uber closely during the application process to find out if you need to have your vehicle inspected. The vehicle you use to drive for Uber does not need to be registered to you, but your name must be on the insurance card or insurance policy declaration. How much insurance coverage does Uber require? Your personal insurance coverage must meet the state minimum. Uber does not require commercial insurance. Most standard personal auto insurance carriers don’t cover rideshare activity, so do a Google search for ‘ridesharing insurance’ in your state to find a policy that covers rideshare. You may find that rideshare add-ons are available for a reasonable extra charge. Liberty Mutual — Policies for rideshare drivers are available in many states! NYC ONLY: INSHUR — Get TLC Insurance for NYC. Use code DOU55 to get a discount. I am affiliated with Liberty Mutual and INSHUR. I may receive a commission for referring you to them. Uber requires all drivers to be licensed to drive in the US for at least one full year, past or present. If you are under age 23, you need three years of driving experience. Your one year of driving experience does not have to be from the state you currently live in. For example: You had a Florida license for five years, then moved to California six months ago. You want to drive for Uber in California. You will meet the meet the licensing requirement as long as you get a California license. Uber does not count international driving experience. Even if you’ve driven internationally for many years, Uber still requires that you have a US license for at least one full year. Can you drive for Uber if you’re not a US citizen? Does Uber make driver requirement exceptions for military members? You may need to submit proof of licensing history if your license was recently issued. Uber may ask you to send additional documents if they need more info about your licensing history. You can submit a previous driver’s license, previous driver’s liencse number, or a motor vehicle report (MVR) issued by the DMV. Your vehicle must license plates that match the state you drive in, along with up-to-date registration tags. There are some exceptions for cities in markets that lie on the border with another state. Uber contracts with a company called Checkr to run a thorough background and driving record check that looks back around 7 years into your history. Have a few speeding tickets over the years? You’ll probably be fine as long as you don’t have any major violations like DUI, DWI, or driving with a suspended license. Uber also screens for criminal activity, so if you have any criminal issues on your record, there’s a chance you’ll be rejected. Does Uber drug test drivers? No, Uber does not require drivers to take a drug test. Does Uber do a credit history check? No, Uber does not perform a credit check. Uber will send you a terms of service and other documents that you need to read and sign before you can be activated as a driver. The documents you have to sign may be different depending on the state you’re in, so keep an eye on your driver app, email and partners.uber.com to see if there are any documents you need to sign. The first thing you need to do to drive for Uber is complete the driver application. create an Uber account, and consent to background screening. Next, you will complete your profile by uploading a picture of your driver’s license, and if already you have a vehicle, you will upload your vehicle information. The background screening can take up to 10 days to complete. To check the status of your application, sign into the driver app or partners.uber.com and check for an account status. If more than 10 days have gone by since you began the background screening process, contact Uber to ask for an update. The best way to send documents to Uber is to take a picture of the document with your smartphone and upload it using the Uber app or partners.uber.com. Make sure the image is clear, with strong lighting and all text in focus. You can also upload a PDF version of the document, which may be useful if you have a PDF copy of your insurance card or registration. Once Uber activates your driver account, how do you start giving rides? Congratulations, you are now an Uber driver! Now what? Once Uber activates your account, you will be able to log into the Uber driver app and turn on driver mode and accept rides. Uber offers some in-app training that will show you how to accept a ride request, how to navigate to the passenger, and how to correctly perform a ride. There are other details about the Uber driver app you may want to know, so I recommend reading the article linked below. After accounting for vehicle expenses, you can expect to make around $10 – $20/hour. Income can vary quite a bit based on your location, the day of the week, and the time of day. Most drivers maximize their income by driving on different days and times and seeing what works best. I’ve heard it said that uber/ lyft drivers are not allowed to park on the street during off hours. I didn’t think it was true. Is it? If someone had a DUI and it has been almost 5 years, will he or she be accepted or rejected?